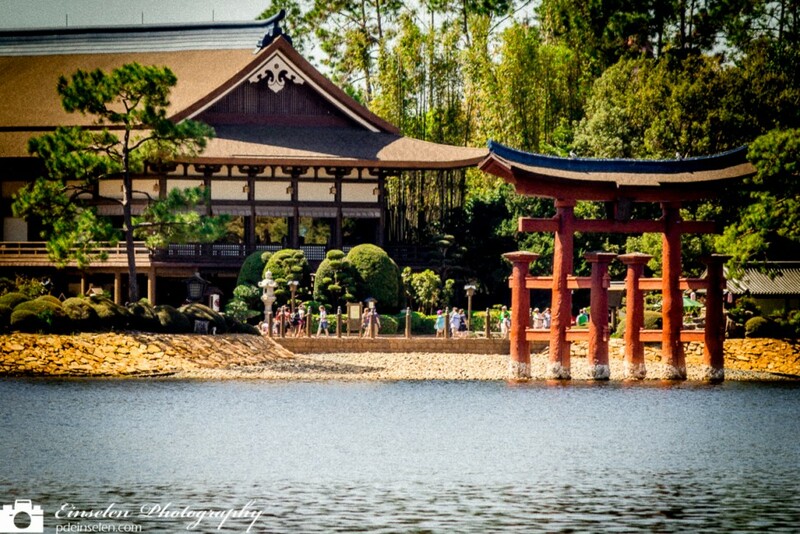 This is a post-processed photo from the Japan Pavilion at EPCOT of the Torii Gate. I shot this photo across World Showcase in the Spring of 2015 and later adjusted it in Lightroom to give an aged look. EPCOT opened in 1981 with Japan as an original country so I used the aged look to make the photo appear I shot it closer to the park opening date. A torii is a traditional Japanese gate often found at entrances of Shinto Shrines. This particular torii gate is modeled after the torii gate in front of the Itsukushima Shrine on the island of Itsukushima. The dramatic gate, or torii, of Itsukushima Shrine is one of Japan’s most popular tourist attractions, and the most recognizable and celebrated feature of the Itsukushima shrine, and the view of the gate in front of the island’s Mount Misen is classified as one of the Three Views of Japan (along with the sand bar Amanohashidate, and Matsushima Bay). Although a gate has been in place since 1168, the current gate dates back only to 1875.The gate, built of decay-resistant camphor wood, is about 16 metres high. The placement of an additional leg in front of and behind each main pillar identifies the torii as reflecting the style of Ryōbu Shintō(dual Shinto), a medieval school of esoteric Japanese Buddhism associated with the Shingon Sect. The torii appears to be floating only at high tide. When the tide is low, it is approachable by foot from the island. Gathering shellfish near the gate is also popular at low tide. At night, powerful lights on the shore illuminate the torii. On September 5, 2004, the shrine was severely damaged by Typhoon Songda. The boardwalks and roof were partially destroyed, and the shrine was temporarily closed for repairs.